CRYENGINE | Crysis Patch 1.2 Available Now! Re: Crysis Patch 1.2 Available Now! bonjovi wrote: Should I update to version 1.1 before applying this patch? Sorry for this newbie question. Any help would be appreciated; I've tried uninstalling, reinstalling, trying to patch it directly afterwards - no go. I've never removed or edited any of the opening movies as they've never bothered me. Retail DVD, and like I've said...I've never had this problem before now. W7 is fully updated with SP1 and there are no errors/faults of any kind on my HDD. So what the heck is it? Bringing a topic back from the dead, but I cannot find information anywhere else. I am trying to install Crysis patch 1.2 (the game plays just fine without it, but I want to play it with the 3rd person view mod, which states it requires patch 1.2. ). I have installed Crysis with no issues whatsoever. Everything but the Comrade application installed from the Crysis DVD (chose not to install Comrade). I have installed patch 1.1 with no issues whatsoever. I play Crysis (single player, I don't do MP) with no issues whatsoever. I have downloaded the 1.2 patch from 5 different sources: they all were the same size, checksum'd the same, and I received the exact same error. I double click on Crysis_patch_1_2.exe (I have admin rights, and have tried Run As as well, same result). I get the Do you want to run this file? 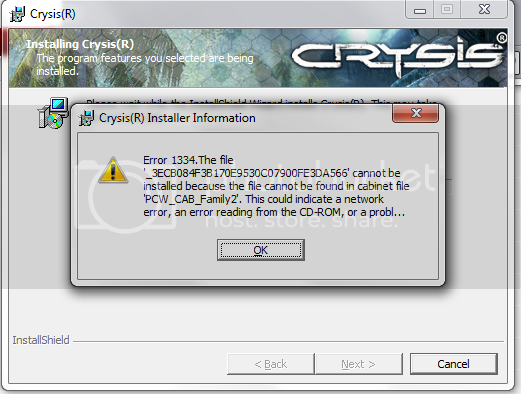 warning, which says the name of the executable is Crysis_Patch_1_2.exe, published by Crytek GmBH, etc. I click run. Within a second or 2, I get the " <executable> has encountered a problem and needs to close. Sorry for the inconvenience. Please tell Microsoft about the problem" pop -up and nothing else (other than the Windows core dump). So, has anyone seen this before? I have seen a number of issues described in many sites, but not this one. how do I down load the patch? I actually have the crysis maximum edition.Do I need it? project_amateur wrote: how do I down load the patch? I actually have the crysis maximum edition.Do I need it? Congrats for all users and this is really a big news that Crysis Patch is Available.Thanks for share this with us.I just amaze to read this and to discover this awesome post. I tryed to acces the link above but is not working anymore. Try www.crysis.com. we no longer host these files here. This is a developer forum now. Steam and Origin users patches automaticly.